Dailey Creek flows into the Illinois River at the end of the Deep Gorge Trail. Follow Highway 199 to Selma and look for the flashing yellow light with the gas station on the corner with the Post Office across the street on the other corner. Turn to follow Illinois River Road (if you turn the other direction you will be on Deer Creek Road). Follow Illinois River Road for 11 miles to where the pavement ends. Continue by following the gravel road to the right for about half a mile and park in the wide turnout on the left. While driving from Selma, be aware the Illinois River Road has a section of unpaved gravel about six miles from where you start at Highway 199. This stretch of gravel surfaced road may develop wash-boards or potholes. It is recommended you slow down as you drive over this fourth-of-a-mile section of road. At seven miles from Selma, the road forks. Stay on the pavement and continues straight ahead. From this point, the road narrows and goes down a curvy section with sharp drop-offs. Drive slow and watch for on-coming traffic. Pull into a turnout to let cars pass. The route follows an old mining road. Several side road are indicated by black dashed lines. 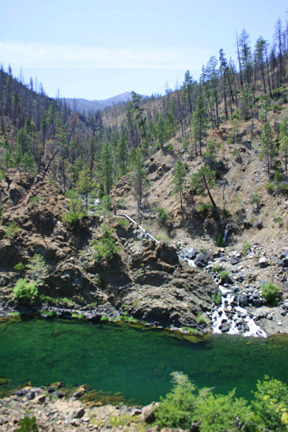 The Deep Gorge Chrome Mine Trail follows an abandoned mining road through a forest heavily burned during the 2002 Biscuit Fire. 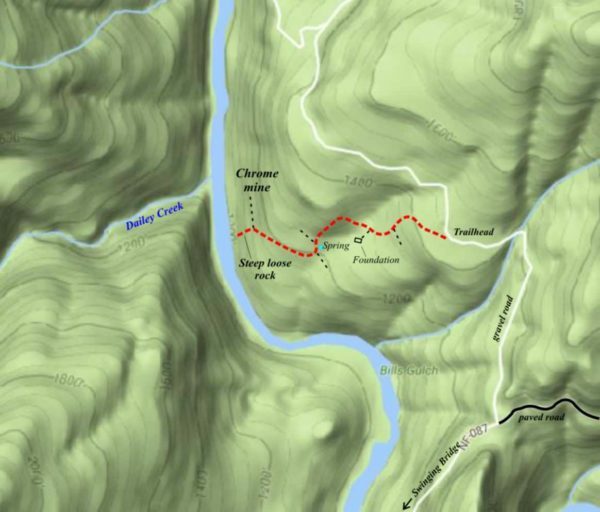 The route passes by an old homestead (the Hill home) and ends at a chrome mine overlooking a remote section of the Wild and Scenic Illinois River corridor. Total distance of the trail is about half a mile with an elevation gain of about 300 feet. WARNING: Hiking in a heavily burned forest such as seen along this trail can be hazardous especially in high winds and inclement weather. Trees may fall and rocks may break loose and roll down the hillside. Be aware that hiking in a burned forest subjects hikers to hazardous conditions for which most hikers have little or no experience. Check with the Forest Service for the latest hiking advisories in the area burned by the Biscuit Fire.